Looking for a family cruise packed with enough fun features to keep your crew busy all day long? The largest cruise ship in the world has you covered. The new 5,497-passenger Harmony of the Seas, the third in Royal Caribbean’s Oasis class, is stuffed to the gills with cool attractions. This ship is offering year-round sailings out of Fort Lauderdale in southeastern Florida. Seven-night cruises are available with itineraries to the Eastern and Western Caribbean. Brave enough to ride the tallest slide at sea? Head to Deck 16 aft, where a giant angler fish marks the entry to the Ultimate Abyss, 10-story side-by-side dry slides that send you zooming into darkness. You'll sit down on a black mat with an opening to place your feet. Lean back, hold on to the strap, and you'll take a swirling slide to a soft landing 10 decks below. Kids must be at least 44 inches tall to ride, and children cannot ride on the lap of an adult. Love water slides? Head to Deck 15 and the Perfect Storm, a trio of multi-story twisty slides suspended five decks above the ship's Central Park outdoor courtyard that will keep thrill-seeking kids happy all day. The blue and yellow Cyclone and Typhoon racer slides twist and turn, while Supercell also twist before depositing riders in a "champagne bowl" before landing. Supercell has clear sections so guests can see those riding the slide. Kids must be at least 48 inches tall to ride. Kids can stay cool on Deck 15 at Splashaway Bay, a colorful waterscape with sea creature water cannons, winding slides, a gigantic drench bucket and a multiplatform jungle gym. Kids 3 to 17 years of age can participate in Royal Caribbean's complimentary Adventure Ocean Youth Program, with age-appropriate activities for each group. The Adventure Ocean program separates kids into five groups: Aquanauts for ages 3 to 5; Explorers for ages 6 to 8; Voyagers for ages 9 to 11; and two teen groups for ages 12 to 14 and 15 to 17. Each group has its own space and programmed activities. On Harmony of the Seas, teens get one of the coolest lounges on the ship on Deck 15 aft, dubbed the Living Room. Babies and toddlers can attend 45-minute Royal Babies (for ages 6 to 18 months) and Royal Tots (for ages 19 to 35 months) play sessions with their parents that incorporate stimulating activities like baby gymnastics and music play. There is also a Royal Babies nursery with supervised group babysitting for children ages 6 to 35 months. Private in-room babysitting is offered for children at least 12 months old. Harmony of the Seas has two of the popular FlowRider surfing simulators on its top deck. Kids must be at least 52 inches tall to use the bodyboard and 58 inches tall to use the flowboard. The Boardwalk neighborhood on Deck 6 evokes the nostalgia of a seaside town, with its handcrafted carousel and arcade. This is also where you'll find the AquaTheater, a venue for high-dive shows into the deepest pool at sea. On Harmony of the Seas families can enjoy a familiar cast of DreamWorks Animation characters including Po of Kung Fu Panda; Shrek, Fiona and Puss in Boots of Shrek; and Alex the Lion, Gloria the Hippo, King Julien and the Penguins from Madagascar. Events and activities include a DreamWorks Character breakfast in the main dining room, meet-and-greet experiences throughout the day, and photo opportunities. Additionally, DreamWorks characters join in activities in Adventure Ocean programming, including story time, dance parties, and games. Year-round, families can watch favorite DreamWorks Animation films on a dedicated DreamWorks TV channel in their staterooms. 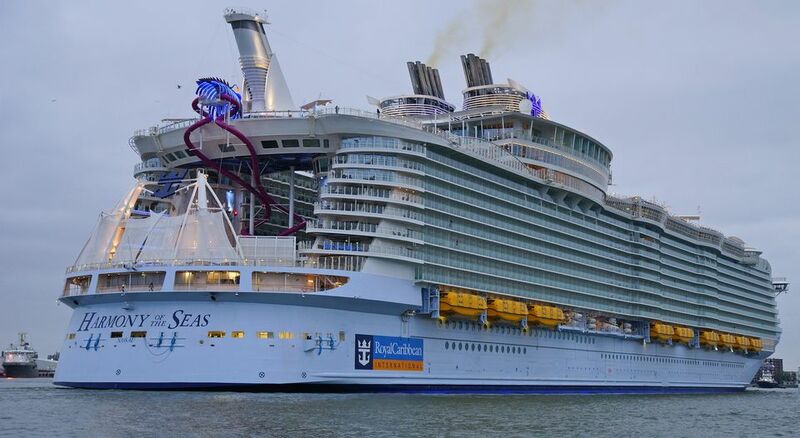 Onboard Harmony of the Seas, families can watch first-run 3D movies by DreamWorks Animation and other film studios. Special 3D glasses are provided just like in your local movie theater. Admission is included in your cruise fare. The ship's 43-foot climbing walls are located on Deck 6 in the Boardwalk neighborhood. Climbers must be at least 6 years old, and climbers under the age of 13 must be accompanied by a parent or guardian. Harmony of the Seas offers 20 dining options, from famous-name restaurants to counter-service cafes and diners. At dinner time, the My Time Dining program delivers the flexibility to select your own seating time and table companions in a dedicated portion of the main dining room or from a variety of specialty restaurants that foodies will love, including Jamie's Italian (from British celebrity chef Jamie Oliver) and 150 Central Park (from James Beard Award-winning chef Michael Schwartz).